Amid New York City protests over police brutality and grand jury verdicts surrounding Eric Garner and Michael Brown, Hollywood made an appearance in New York City last night. Ava DuVernay’s premiere of Selma took place, and the director and her amazing cast stood in solidarity with protesters across the country and donned “I Can’t Breathe” T-shirts. 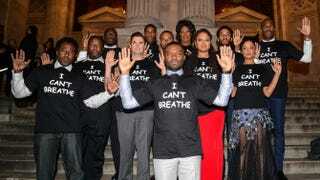 On the steps of the New York Public Library, DuVernay and actors David Oyelowo, E. Roger Mitchell, Wendell Pierce, Omar Dorsey, John Lavelle, Stephan James, Kent Faulcon, Lorraine Toussaint, Andre Holland, Tessa Thompson and Colman Domingo wore the T-shirts over their party attire and held their arms in the “Don’t shoot” pose. It was quite apropos for the cast to wear the shirts, especially since Selma centers on the civil rights movement. During a time when people feel that those rights haven’t fully been attained and continue to be violated, it was definitely more than a photo op.